© Tony Bartholomew 07802 400651/mail@bartpics.co.uk PICTURE COPYRIGHT TONY BARTHOLOMEW ALL PICTURES SUPPLIED TO THE STEPHEN JOSEPH THEATRE FOR USE IN PRESS,PUBLICITY FOR THIS PRODUCTION AND FOR USE ON ALL IN HOUSE PUBLICATIONS AND WEBSITES. Emma Manton as Paula, Richard Stacey as Harry, Elizabeth Boag as Bernice in Confusions written and directed by Alan Ayckbourn at the Stephen Joseph Theatre in Scarborough from 9th July - 26th September. 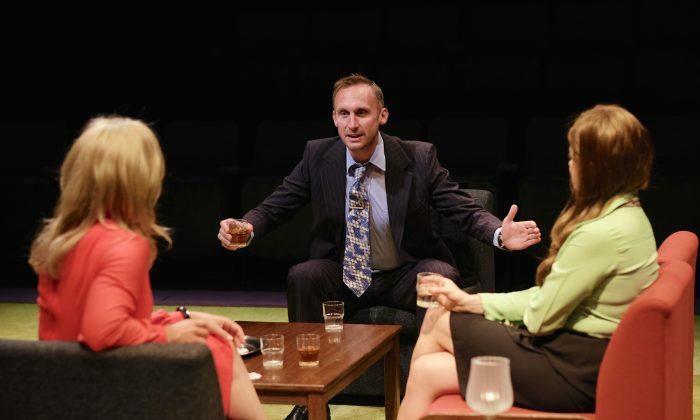 NEW YORK—Playwright Alan Ayckbourn is at his best when commenting on social situations, as proven in a delightful revival of his 1974 quintet of one-act comedies, “Confusions.” The different stories link together loosely and focus on the idea of being emotionally alone. “Confusions” runs in repertory with Ayckbourn’s “Hero’s Welcome” at the “Brits Off-Broadway” Festival at 59E59 Theaters. In “Mother Figure,” Lucy (Elizabeth Boag), a housewife with a traveling salesman for a husband, spends all her time taking care of her young children. Concerned about not seeing her for some time, Lucy’s next door neighbor, Rosemary (Charlotte Harwood), drops by for a chat. Rosemary discovers that Lucy has so immersed herself in her parenting role that she’s unable to relate to people in any other way. Lucy treats Rosemary as if she was another child, talking to her in an authoritative manner and brooking no backtalk whatsoever. Soon Rosemary’s chauvinistic husband, Terry (Stephen Billington), stops by looking for his wife only to find himself receiving milk and cookies. He also gets a good talking to over his behavior towards Rosemary. A psychoanalyst could have a field day with this scenario. One woman has literally become the role she has taken on, and two visiting adults find themselves getting in touch with their inner children rather quickly. “Drinking Companion” takes place in the bar in a hotel lobby. Harry (Richard Stacey), the aforementioned husband of Lucy, is trying to make time with Paula (Harwood), plying her with drinks and telling her sob stories about his marriage. When Paula’s friend Bernice (Boag) enters, Harry invites her to join them, oblivious to the fact both women want to get as far away from him as possible. Stacey does a good job at making Harry a sad sack of a fellow, who has come to prefer the occasional one-night stand as a salve to his life on the road. Of all the plays presented, this is the only one that feels dated in terms of changing attitudes regarding sexual harassment. Any uncomfortable moments are handled by the fact that neither woman is ever in any real danger, and Harry comes off as more an object of pity than one of fear. The short piece also features Stephen Billington. Taking place in the dining room of the same hotel is “Between Mouthfuls.” Martin (Stacey) and his wife Polly (Harwood) have just sat down to eat when he notices his boss (Russell Dixon) and wife (Boag) at a nearby table. With conversations switching back and forth between the two couples, it soon becomes apparent that one member from each pairing is considerately closer with a member of the other’s than their legitimate partner would prefer. While one can pretty much figure out the guilty parties before it is actual revealed, it’s the attitudes of those involved that make the dinner so enjoyable to watch. Billington does a particularly nice turn as the harried waiter serving both tables. An interesting look at martial problems and the importance of communication, the play shows one couple heading for where the other has long since resigned itself to be. In “Gosforth’s Fête,” things turn deliciously farcical as private secrets become public knowledge during a town festival. As Gosforth (Dixon), owner of the local pub, tries to keep the event going as scheduled, his tryst with a local girl (Harwood) comes back to haunt him, while her fiancée (Billington) tries to drown his sorrows in drink. Things go from bad to worse thanks to a defective public address system. Played perfectly straight by the entire cast, the effect is enough to reduce one to tears of laughter. Particularly effective are Dixon, calling to mind the captain of sinking ship trying to assure his passengers all is well, and Boag as a society lady who manages to maintain her dignity even as things get out of control. Also featured is Richard Stacey as a somewhat befuddled vicar. The final work, “A Talk in the Park,” bring things full circle. The scene opens with four people each sitting on a different bench. A man (Dixon) arrives and sits down on one of them and begins to talk to a woman (Boag) already there. She, wanting some quiet, moves over to the next bench, only to find herself talking to the man (Stacey) she finds there. This pattern continues, each person sits down wanting to talk about things on their mind, while the person next to him or her only wants peace and quiet. That is, until they find themselves driven away from their now-invaded sanctuary and start invading someone else’s. Also featuring Charlotte Harwood and Stephen Billington, the play asks the question, how can we expect others to want to talk to us when we don’t want to talk to them? Ayckbourn, who also serves as the director, guides the different stories with a sure hand, bringing forth the proper emotions and atmosphere for each. Add to this the excellent cast in their multiple roles, and the result is very enjoyable indeed.